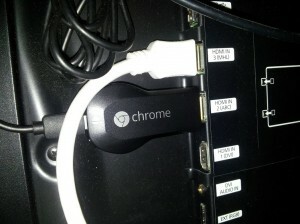 Back in September 2013 I was in the US for work and got myself a Chromecast dongle. You know this neat little thing that sits behind the TV and let you watch internet content on the TV. Way better than the “smart” TV features and I really appreciate using it to watch thing on the big screen. Today Google announced Google Cast for Audio and I’m really happy that Google is not abandoning like they have done with Google TV and Nexus Q. On the other hand the Chromecast concept is a typical Google product – two years down the road it’s still not a full complete product. It’s slow in starting up. It’s often loosing the network and I regularly need to give it first aid by rebooting it or the computer I use for casting from. Sometimes it work like charm and other times it’s stuttering like an old Ford T.
Back to Google cast for audio. The idea is nice and I might even bye the speakers but I can’t help wondering when I see an cool add like the one for Cast for audio – will they finally make it work this time? I hate to be negative all the time, but I expect the reality being like a Big Mac – you know the Big Mac on the on the add poster and the not so big mac in the box. It has been great to see many new apps for Chromecast and official support outside the US. Besides the backdrop the greatest improvement for me has been the pseudo full screen of the chrome cast plugin in Chrome and a significant less load on the host computer than back in the first days. Backdrop as a platform (let google music and others stream audio and album info while still maintaining a nice full screen backdrop). Let Google Now, phone notifications and other notifications too be shown as overlay. This entry was posted in Gadgets and tagged Chromecast, Gadgets on Monday, January 5, 2015 by Martin.